Quickly compare changes to all files in Git (staged/unstaged files or a commit) or TFS (shelveset, changeset, or with pending changes). Quickly and easily compare all files in Git (a commit or Staged/Unstaged files) or TFS (a changeset, shelveset, or files with pending changes) to see what has changed. Instead of clicking on each file individually and choosing to compare it with a different version, just click one button to compare all of the files. 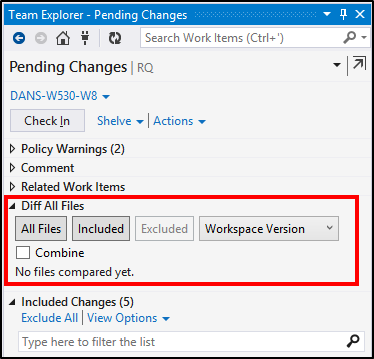 You may edit the extension's settings from the Tools -> Options... -> Diff All Files settings page. Visit the Diff All Files project homepage for more information or to make a feature request or bug report. This extension is also available for Visual Studio 2015, 2013, and 2012. Compare files one at a time, many files at a time, or with all files combined in a single file. Uses the same diff (i.e. 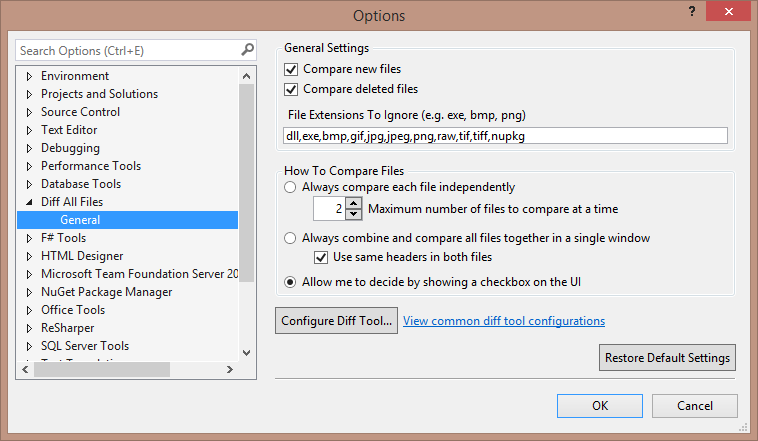 compare) tool that you have configured in your .gitconfig (for Git) and Visual Studio (for TFVC). e.g. KDiff, Beyond Compare, Visual Studio, etc. 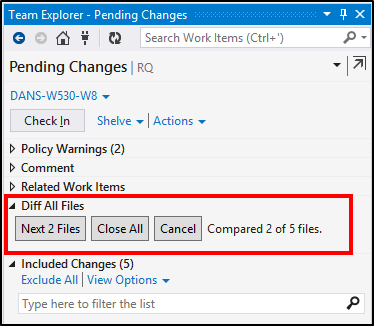 Exclude comparing files with specific extensions, or files that have been added or deleted from source control. Button to quickly close all diff tool windows that have been opened. Specify the file versions to compare against (i.e. Unmodified, Workspace, Previous, Latest). Supports both Git and TFVC source control providers. Remove asynchronous loading on background thread, as it would cause the UI to throw errors if the controls were visible right away at Visual Studio startup. Remove unnecessary dependencies preventing installation on some systems. Initial release of VS 2019 version of extension.